I have used Viktoria De Ann Products approximately 8 to 10 years. They completely changed my skin. I can honestly say they took a good 10 to 15 years off my face. 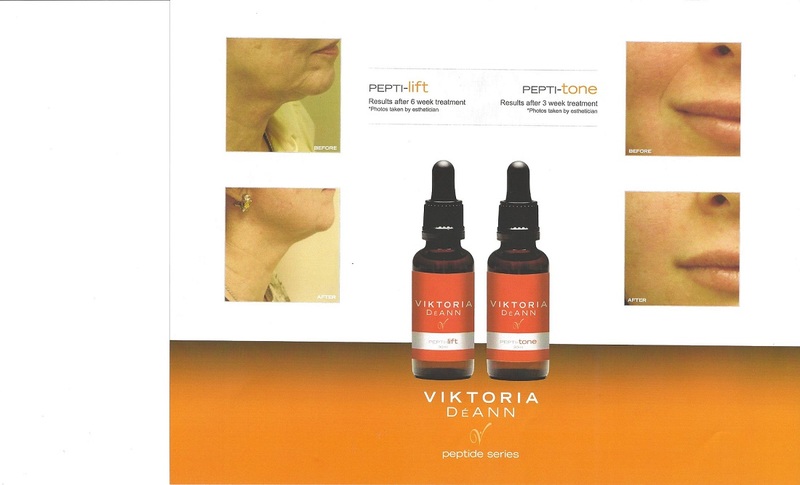 The Pepti Lift, Pepti Tone, help with firming, toning and lifting. the Pepti Elastin helps with jowls. The Pepti Eye Serum is Amazing. It helps with crows feet, lines and saggy lids. You need to use it twice per day for best result. Everyone’s results are different. You need to give it time for the peptides to do their work. My customers love it. It is all done under the skin where it matters. The serum reacts with your own Amino Acid and you grow your own peptides. The longer you use them the better you look. Younger, firmer, toned, and healthy skin. If you do not want to look your age, this is the product line to use. We are not allow to show pricing online. You need to contact us by phone at 866 568-8858. You may also send an email or send me a message at the bottom of the website. We would love to help you decide what is best for your skin. 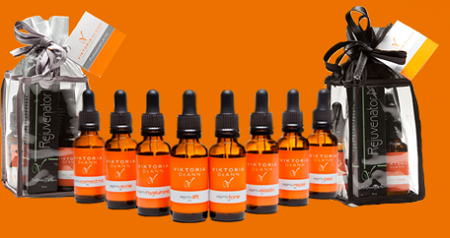 Viktoria De Ann products will give you the skin that you have been searching for. This product line works. It is different. It works with your body to create your own peptides. It is not just a topical product like so many product lines are. They make a product to address each issue of the skin. Lines, wrinkles, drooping, jowls, crows feet. wrinkles around the mouth. All the challenges we all have. On my website I explain each product and want its benefits are. I have used Viktoria De Ann for approximately 4 years and know what these products do. They have taken 15 years off my face. I highly recommend them. You are welcome to call me on my toll free number or email me with questions. I am happy to put you on the best products for you. I have been using Pepti Elastin by Viktoria de Ann for several weeks now and love it. I have used Viktoria De Ann Products for over 3 years now and they have made a huge difference on my skin. Tighter, more firm, less lines. They honestly take a good 10 years off the face. Now with the addition of Pepti Elastin, my jowl area is tighter and more lifted. I highly recommend these products. I am so picky and careful with the products I sell to my customers. The Viktoria De Ann line has so much science behind them and I trust them. Please go to my website, email or call for questions. You need to log in for more information. These products are sold to my Preferred Customers only. The above picture is my own eye. It was taken after 2 days at a skin care show. I was hot and tired. As you can see, I have no lines around my eyes. This picture is as close as you can get and it is un-retouched. Viktoria De Ann suggests using the product at night. I personally use it twice per day. 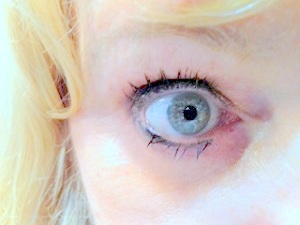 I apply the serum under my eyes, on the side (crowsfeet) on the lid, and under the brow. Everyone always assumes I use Botox, but the answer is no. I am not a lover of Botox or its toxins. You may go to my website. http://www.karinherzog-jmilan.com. You need to log in for pricing. This is required by Viktoria De Ann. I have the products for my customers only. Viktoria De Ann is one of my favorite products that I use and sell to my clients. I have seen such changes with my own skin. Their products are peptide messengers, so they are applied topically. They more or less help your own Amino Acids to replenish. It takes 28 days for peptides to work. The longer you use them, the better the results. In time you will notice your fine lines soften and be much less noticeable. Daily, I am asked why I do not have any wrinkles. I say Viktoria De Ann is the reason. If anything, just start with the eye serum. You will see your wrinkles slowly disappear. You may purchase these products from me by calling 866-568-8858. Or go to my website http://www.karinherzog-jmilan.com. You must log in for pricing. I have them available for my clients. Or if you have any questions email me at jmilanent@gmail.com . You may also purchase from your skin care provider or physician.